Barbie could never take Megatron, but in the 80's girls vs 80's boys bootcamp, one fan doesn't seem to think a victor was all that clear-cut. Feast your eyes upon the Transformers / My Little Pony Cosplay / Body Paint mash-up, almost with more forward slashes than your average URL! 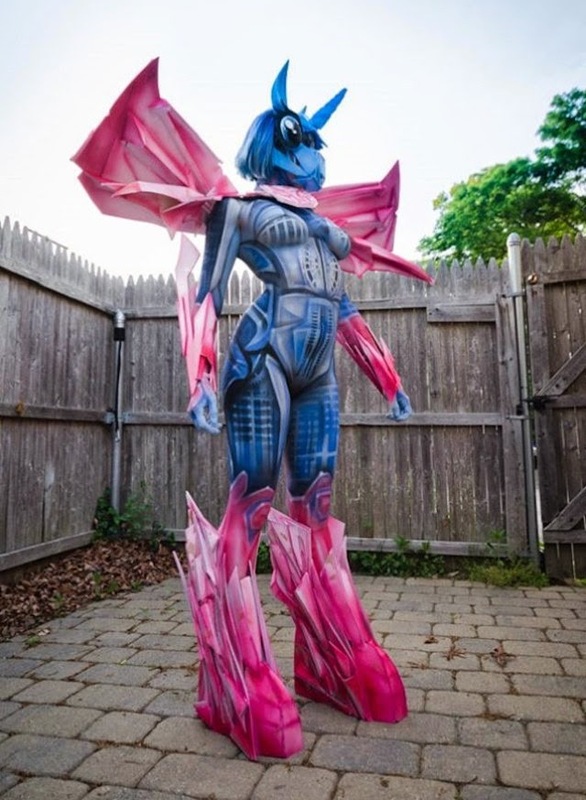 While it does have more of a hint of Unicron in drag to it than wholesome Hasbro based fun usually should, Rouston Bodypaint's 10 hour costume creation and 2.5 hour body painting session to complete, sure makes for a visual that stops you in your tracks. That... is some dame fine body paint. It's all about the wings Karl - all about the wings. And not touching the sofa till the camera man's ready.